We provide flyer printing and flyer distribution service in Malaysia for marketing and promotion purposes. Our clients are from different industries such as retail outlets, restaurants, hypermarkets and many more. It doesn’t matter what business you are doing as we are ready to print flyers and distribute them for you whenever needed. 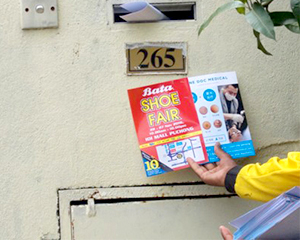 Even though everyone is catching up on digital technology, flyers are still very useful because it is more personal compared to digital media. On top of that, it is convenient for someone to grab a flyer that’s placed outside a restaurant and refer directly to it instead of using the internet. The flyer printing that we provide in Malaysia is designed based on the colours that suit your business and corporation, at the same time creative enough to grab the public’s attention. We would also make sure the design of the flyer is in line with your company goals so that your needs are satisfied. Our designers will come up with a design that aims at your target audience depending on the research done on their background. The team at Art & Creative Media will ensure that the flyers achieve the company’s marketing and promotion purposes, thus gaining maximum return on investment (ROI). We work with newspaper agencies in order to slip all your flyers into the newspapers which are then distributed to households or offices. Art & Creative Media offering flyer distribution service in Malaysia. We prints and distributes flyers in Malaysia, and the locations that we cover include all of Klang Valley and also other states like Penang, Johor and Ipoh. We believe that by expanding the area of distribution, we will be able to reach out to more audience around Malaysia.